Something spooky this way comes according to Netflix's 2018 New York Comic Con lineup. Netflix aims to delight fans with a full range of laughs and frights, and even a superhero to save the day! First up is Netflix Presents Big Mouth, Friday, October 5 at 4:00 pm to 5:00 pm in the Javits Convention Center, Room 1A06. Get comfortable being uncomfortable with your favorite puberty-driven animated series Big Mouth! Join Nick Kroll, John Mulaney, Jessi Klein, and Jason Mantzoukas, along with executive producers as they take on NYCC with an exclusive live read from a new episode of the highly-anticipated second season. Hilarity is sure to ensue as the show takes on all things borderline raunchy. Talent includes Nick Kroll, John Mulaney, Jenny Slate, Jessi Klein, Jason Mantzoukas and Executive Producers Andrew Goldberg, Jen Flackett and Mark Levin. 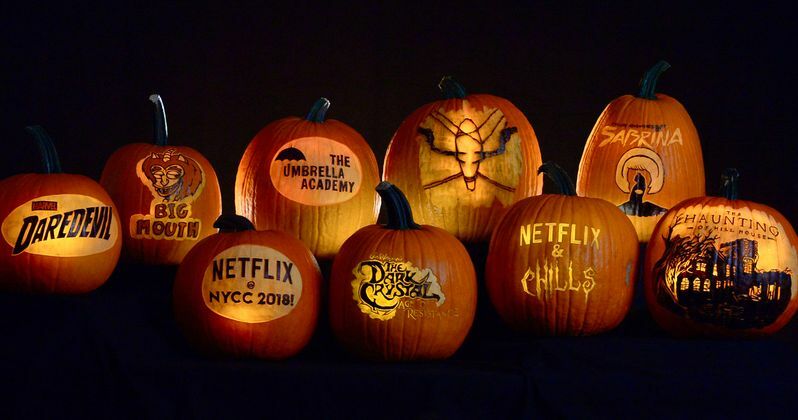 Next is Netflix & Chills, from 7:30 pm to 9:30 pm on the Mainstage.The midnight hour is close at hand with Netflix's Mega Block of chills, thrills, and everything else of the other-worldly variety. Join the casts of The Umbrella Academy, The Haunting of Hill House and Chilling Adventures of Sabrina as they descend upon New York Comic Con to discuss their highly anticipated new series'. Plus, get a first look at The Dark Crystal: Age of Resistance before anyone else. The conversations will leave you sleeping with the lights on and texting your friends about the surprises along the way! The Umbrella Academy Talent includes Ellen Page, Mary J. Blige, Tom Hopper, Robert Sheehan, Emmy Raver-Lampman, David Castañeda, Aidan Gallagher, and Cameron Britton. The Haunting of Hill House Talent includes Michiel Huisman, Elizabeth Reaser, Kate Siegel, Henry Thomas, Oliver Jackson-Cohen, and Victoria Pedretti. Dark Crystal: Age of Resistance Talent includes Lisa Henson, Louis Leterrier. And the The Chilling Adventures of Sabrina Talent includes Roberto Aguirre-Sacasa (Creator/EP/Writer), Kiernan Shipka, Miranda Otto, Lucy Davis, Ross Lynch, Michelle Gomez, and Chance Perdomo. Saturday kicks off with Marvel's Daredevil at 1:30 pm to 2:45 pm in the theater at Madison Square Garden. Witness New York Comic Con's highly anticipated return of Daredevil, Marvel's first superhero on Netflix! Join the series' stars Charlie Cox, Elden Henson, Deborah Ann Woll, Vincent D'Onofrio, Joanne Whalley, Wilson Bethel, Jay Ali, series showrunner, Erik Oleson and Executive Producer and Marvel's Head of Television, Jeph Loeb for what promises to be an epic panel full of surprise reveals. Talent includes Charlie Cox, Elden Henson, Deborah Ann Woll, Vincent D'Onofrio, Joanne Whalley, Wilson Bethel, Jay Ali and series showrunner, Erik Oleson.